The UNESCO World Heritage Committee has said that in order to protect the Reef we must tackle climate change. And what exactly is the Australian government doing about climate change? You guessed it: as little as possible. The truth is: Turnbull is sending our Reef to the grave by handing over billions to the fossil fuel industry. The Great Barrier Reef is dying at the hands of the Australian Government. Australia is the biggest exporter of coal in the world and the government is sinking billions of dollars of public money into fossil fuels. The Great Barrier Reef is at a tipping point. After two severe coral bleaching events in the past two years, the Reef is now suffering through back-to-back mass coral die-off events. An estimated 29% of the Reef died last year, and we are anticipating a further 19% this year. The single greatest threat to coral reefs is climate change and once coral dies it is gone forever. Australia’s natural wonder, the Great Barrier Reef, is in grave danger. Coral reefs are incredibly important to our oceans. But can this one still be saved? The coral gardens of the Great Barrier Reef are places of outstanding natural beauty – as well as nurseries where young fish are born and find sanctuary until they are mature enough to venture out into the vast expanses of the ocean. This makes corals of crucial importance for oceanic life. 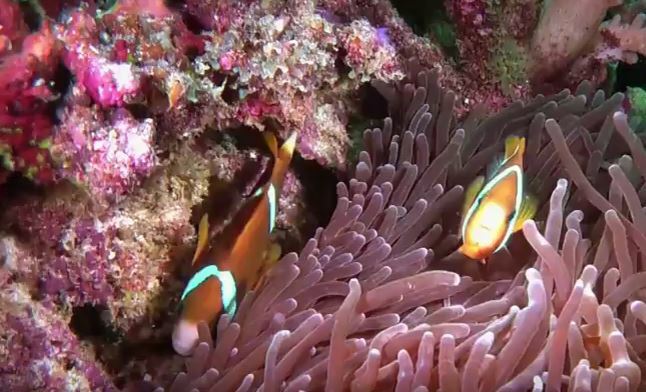 The documentary follows a film crew on a journey along the Great Barrier Reef. On the way they meet Keith und Helen from Melbourne; every year the pensioners set off in their camper van to spend the winter in Australia’s tropical north. Together they discover the abundance of aquatic life in the Great Barrier Reef.